Earlier last week, I shared my a Free Crochet Pattern for my 15″ Granny Square, and mentioned a fun accessory I had coming this weekend. Ta-dah! 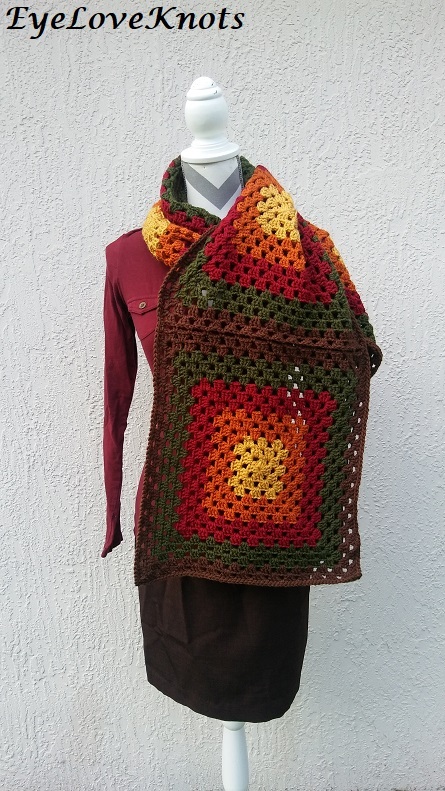 Here’s my Fall Inspired, Granny Square Rectangle Shawl! Several months ago, my friend Bob invited me over to put up a table at a garage sale he was having. Three other friends of his were also there, and we were all set up in a small area across from each other. At the end of the day, when we all started packing up, we were visiting each others tables and exchanging items. One item I was given was this granny square rectangle shawl. 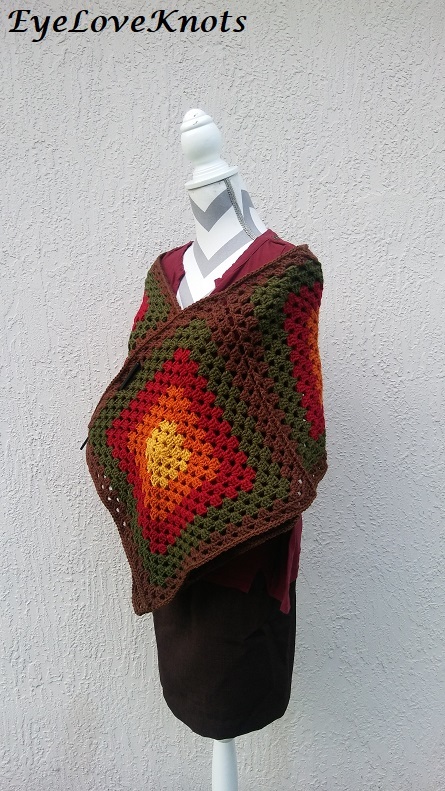 This shawl measures 46 7/8″ wide by 22.25″, and is comprised of two large granny squares seamed together with a single crochet join. While I was not crazy about the colors and there is paint that got on it at some point, I was in love with the idea, so finally, this week I was able to put together my own version of it. Shop EyeLoveKnots Etsy: Granny Square Rectangle Shawl. 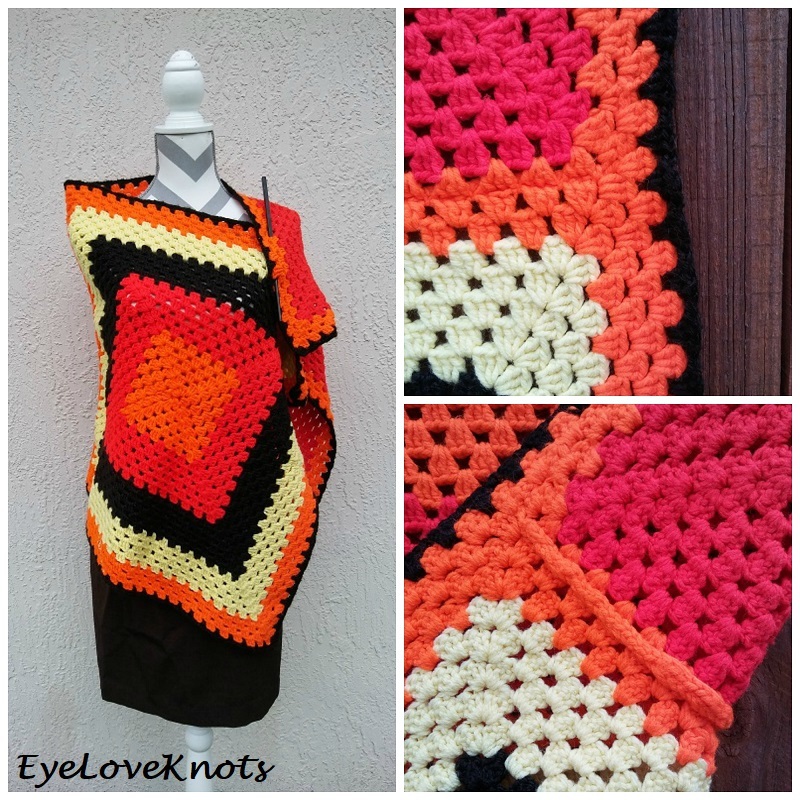 Shop EyeLoveKnots Craftsy: Granny Square Rectangle Shawl. Are you a Raveler? 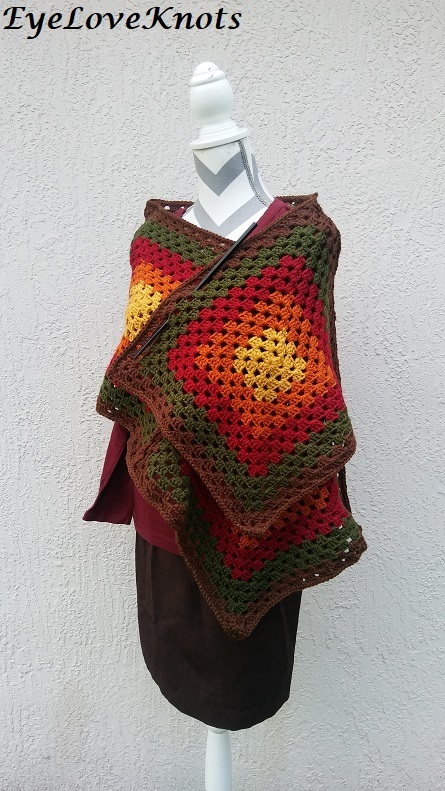 PDF available for purchase; Share your version of this project on Ravelry – Granny Square Rectangle Shawl. 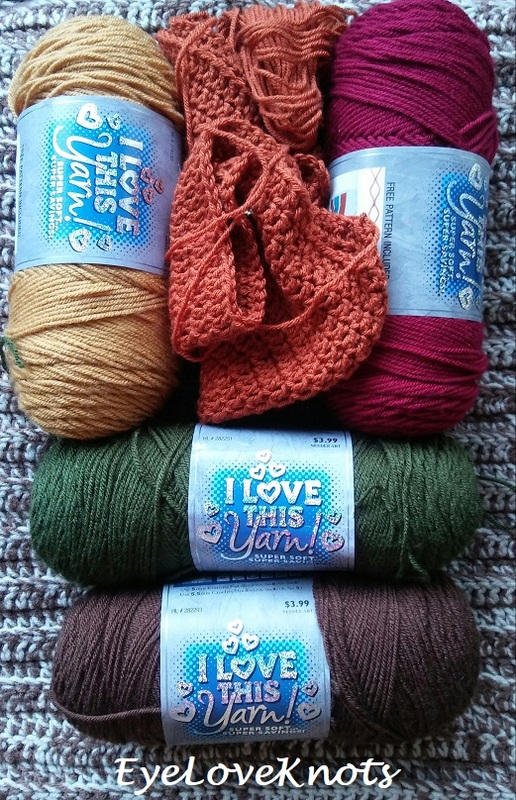 606 – 808 Yards of Worsted Weight Yarn – I used Hobby Lobby’s I Love This Yarn – 150 – 200 Yards of Brown, 75 – 100 Yards of Burnt Pumpkin, 6 – 8 Yards of Sungold, 225 – 300 Yards of Cranberry, and 150 – 200 Yards of Dark Olive. 15″ Granny Square, Free Crochet Pattern here on the EyeLoveKnots blog! Each square took me about 2 hours to complete, so a three squared shawl in about 6 hours, and a four squared shawl in about 8 hours. If you have less color changes, you’ll finish even faster with less ends to weave in! 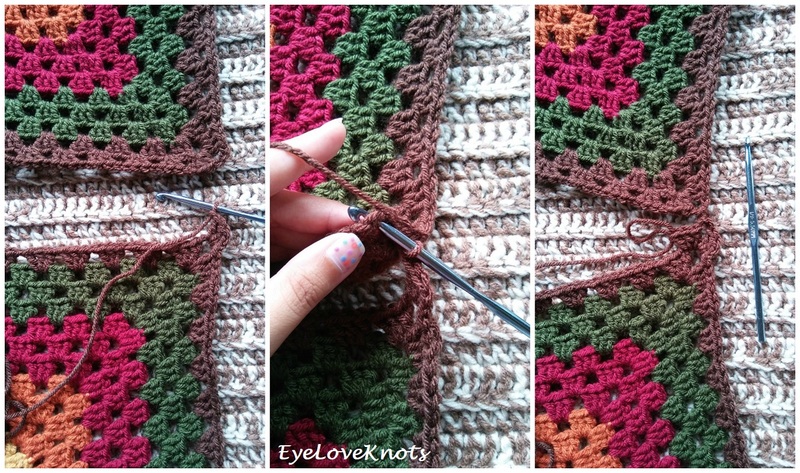 I have a photo tutorial for joining as you go: Join-As-You-Go Granny Squares the EyeLoveKnots Way. First, we need one complete granny square done. Because Google penalizes bloggers for repetitive content, I am going to direct you to my 15″ Granny Square Free Crochet Pattern. 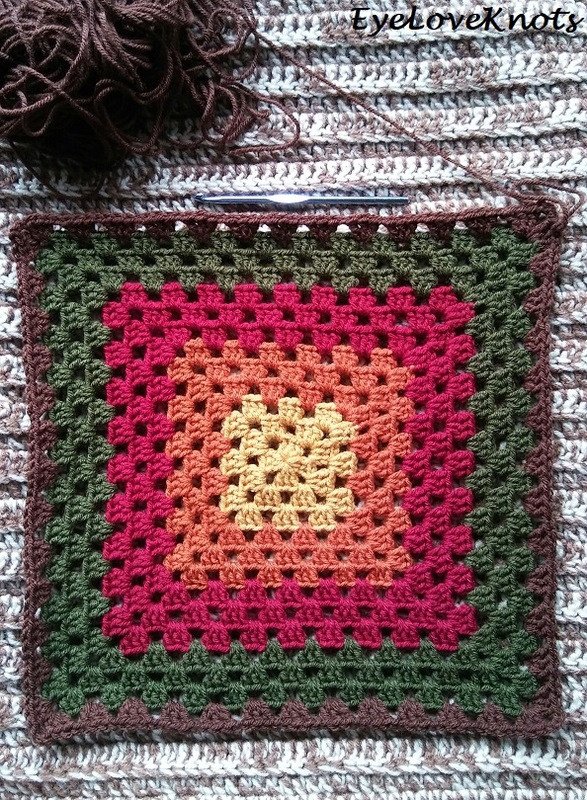 For the remaining 2 – 3 squares, you will also use the 15″ Granny Square Free Crochet Pattern, but only work up through Row 13. 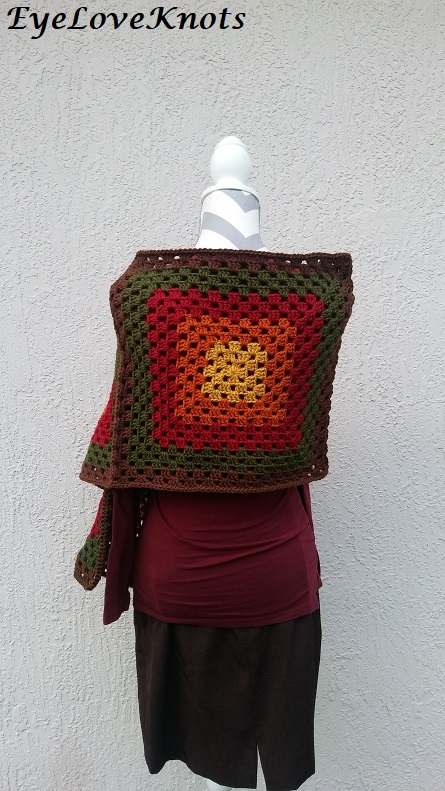 Please feel free to make and sell your own Granny Square Rectangle Shawl using this pattern, but please DO NOT claim this pattern as your own nor should you sell my pattern, and DO NOT re-publish my photos as your own. DO NOT copy and paste my pattern anywhere, link to it instead. I do love a good granny square project. Me too! Fall colors have a way of doing that to us, don’t they? Love the colors in this style. Those large granny squares do make an original scarf. Love this idea. A simple granny square but with a great result! And looove the colors. Makes me hope for autumn to start soon. It seems to be delayed here in the Netherlands. Today only we are having some really beautiful fall-like weather in Florida, but it never stays. So funny because cooler weather always makes me think of Christmas, as this is the only time we ever really have it. Hehe. Best wishes! Thank you for dropping me a line. Beautiful scarf. Thanks for sharing the pattern.